YIATROS GROUP OF COMPANIES has a breathtaking portfolio or residences in beautiful yet prime locations built to the highest standards. We have a wide range of properties at a reasonable price to suit all budgets and we can build your home to meet your own personal specific requirements. Aristo Developers is one of the most dynamic innovative development companies based in Cyprus and Greece with representative offices in more than 80 countries, offering a wide range of beautifully designed properties in Cyprus and Greece, combining excellent after sales service, property management and easy payment facilities. Pafilia Cyprus Property Developers ranks as a leading land developer in Cyprus, focusing exclusively on southern Cyprus. Our properties are developed in the most spectacular locations, including Paphos (also sometimes spelt Pafos or Pathos) and its surrounding areas, as well as Polis and Limassol. The company specializes in high quality construction projects that include the developments of Luxury Houses, villas, apartments, offices and shops. Kanika Developments with its long experience guarantees prompt delivery, high quality construction, secured title deeds and after sales service such as property management and resales. Athanasiou Constructions & Developments is the premier provider of products and services to the construction industry in Cyprus. We have established and maintained a leading role to the 20th Century and now we plan to meet the challenges of the 21st Century. D. G. Lordos Estates have their mark in prestigious and famous projects in all towns of Cyprus and many mountainous villages surrounding Limassol such as Episkopi and Souni-Zanatzia as well as Paphos. 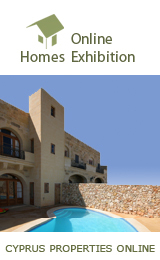 We are offering a wide variety of properties throughout the south and the southwest of the island in Paphos, Limassol, Larnaca and Troodos districts.Our team of architects and engineers are able to assist you in designing your own home either in line with your instructions or from one of our popular designs.